No fooling — Printing with JELLO!! Midcoast Printmakers in Damariscotta will host a workshop on printing with gelatin. Monday, April 1, from 1 p.m. until 4 p.m. at Midcoast Printmakers Studio at Roundtop Farm. No press required! Join Debra Arter for an afternoon of fun! Great class for all artists who work in fiber, paint, collage or pastel. 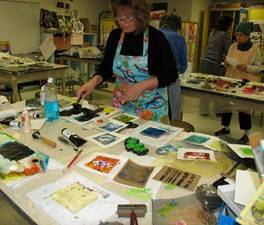 Beginning printmakers also welcome! Each participant will create a myriad of unique one-of-a-kind prints using unflavored gelatin as a palette. Only non-toxic inks will be used so kids over age of 10 may accompany adults if desired. The resulting images may be used for cards, artwork, invitation, framable prints, bookmarks and more. Playing with your food has never been this exciting! Fee for 3 hr. class is $40 which covers all supplies. Space is limited so enroll early. Contact Debra at 563 – 7100. Artists may submit two entries – both prints will be eligible for exhibition.